$1.2 billion proposal to redevelop waterfront area will be fleshed out during the next two years. SAN DIEGO — The Port of San Diego and the 1HWY1 team will enter into an exclusive negotiating agreement (ENA) as part of an effort to redevelop the city of San Diego’s Central Embarcadero district. 1HWY1 and the port district hopes to upgrade a portion of the San Diego waterfront just east of Harbor Island and directly adjacent to an area where hundreds of recreational boats are moored or docked. 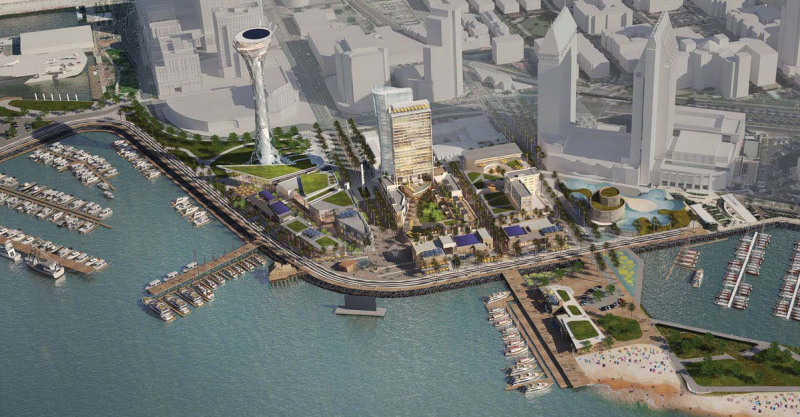 Current plans call for the selected developer to bring an aquarium, hotels, maritime office uses, retail and restaurant spaces, and a Space Needle-like spire to the San Diego waterfront. The spire element of the project would be a 500-foot structure with an observation deck at the top. 1HWY1, a development entity to be created specifically for the Central Embarcadero revitalization, projected the revitalization of San Diego’s waterfront would cost about $1.2 billion. Commissioners hope the ENA process would not be as drawn out as the RIDA redevelopment of Chula Vista Harbor. Whether the negotiation process would be completed in a timely manner was not the commission’s only concern. The project site apparently sits atop an earthquake fault, which is being studied by the developer and port district staff. Boating and fishing interests would also be incorporated into the redevelopment plans, according to port district staff – although the nature of such plans is still being ironed out. 1HWY1 also hopes to work with Scripps Institution of Oceanography to bring a maritime academy to the tidelands district. San Diego’s Central Embarcadero includes Seaport Village and Tuna Harbor Dockside Market; the southern portion of the Central Embarcadero envelops a portion of the Marriott Marquis Marina. In all 70 acres of land and water between USS Midway and Marriott Marquis Marina and Hotel would be redeveloped under 1HWY1’s proposed project. The ENA process, which is expected to last two years, was approved May 16; commissioners are expected to review project details at the end of the ENA process. 1HWY1 will also have to provide the port district with updates on its debt and equity commitments throughout the ENA period. The developer must also provide the commission and port district staff with a project description in one year. Commissioners Robert Valderrama and Garry Bonelli were not present during the 1HWY1 discussion; Commissioner Anne Moore was excused from voting.